I’ve spent a great deal of the last two years of my career studying and researching what a good 21st-century education looks like. There is increasing evidence that in order to manage the ever-changing context of business and society it takes more than just a great SAT score. Certainly, if you read the latest book on Emotional Intelligence by Daniel Goleman there’s much more to the being successful in business than going to school to earn your MBA. Goleman indicates that a certain skill set needs to be mastered in order to achieve the most out of your career. It strikes me that a full trained master coxswain must possess and use many of the 21st-century skills required for success to bring the maximum out of a set of motivated athletes. Obviously, the first three headings could be applicable to any capable athlete in your program. One might even view them as prerequisites for the coxswain seat. However, it’s the second three that I believe are the most important for the coxswain seat. In order for a crew to truly sing and resonate a coxswain must have an inquiring mind. The person in that role must have the courage and curiosity to find out what works with a crew and what does not. When something clicks in a crew that is when the creativity and critical thinking come into play. The coxswain must be able to deliver important information and keep the crew cohesive and focused. Finding out what makes a person tick is a vital leadership skill. There may be many techniques to leading others. These techniques may include several styles of leadership involving the ability to motivate others toward a goal, to coach others to row better or higher levels of fitness. The leadership may involve creating harmony and cohesiveness in a crew or valuing other people’s point of view. The coxswain should also be commanding and a pacesetter in the correct measure. 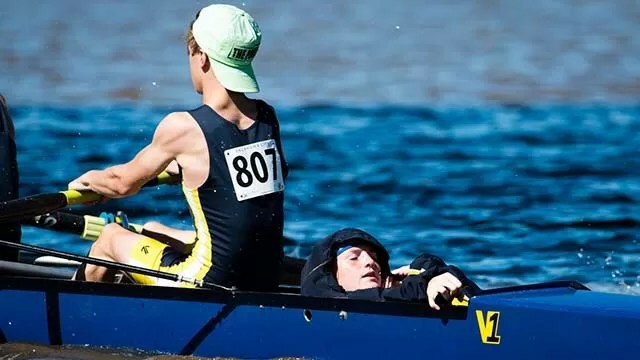 In addition, there are often many situations on race day when a coxswain must have the ability to analyze the situation and make a good decision right in the moment. Ask any coxswain who has steered the Head of the Charles course in Boston in late October. The reality is that it doesn’t matter how many times the coxswain has run the correct line through Weeks footbridge with their coach or teammate, there are other variables in play. These include the positions of other crews, obstructions and weather conditions. Critical thinking, analysis, and good decision making rule the day here. This is what I find most exciting about the opportunity to cox. You’ve got to have all of these ideas and skills above in balance in order to achieve the best results. The coxswain seat also presents a unique opportunity for a student-athlete to participate in athletics. I teach in Oklahoma and so football tends to be a big focus for high schools. However, what about those other athletes that are 100-120lbs who don’t have the ability to start for their teams? If you have a rowing club in your area and you think that this might be something you want to explore, I’d advise you to head over to http://www.row2k.com to find out how you might get involved.